Managing diabetes is easy with Clever Chek Glucose Test Strips. Requiring only 0.7 micro liter of blood, these test strips are custom designed for effective and easy handling. 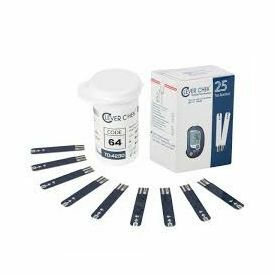 Comes in a pack of 50 strips, each to be used with a Clever Chek TD – 4230 meter Blood Glucose Meter. 1. Compatible with Clever Chek TD – 4230 meter Blood Glucose Meter. Test Strips expire 90 days after opening the test strip vial. Store in a cool dry place between 4 degrees and 40 degrees. Do not Freeze. Use the strips in environment less than 85% humidity. Keep the strips away from direct sunlight.